"Roseanna's Reply is a WWII era novel based on historical fact that blends famous wartime personalities with the book's principal characters in a fascinating manner. With aviation as the background, the book is an action mystery story that I think everyone will enjoy. There is a lot of accurate and interesting information about the creation of the P-51 Mustang that is not well known. It's a good read that will keep your interest till the last page." "This is a stylish novel of the 1940's peopled with some of the greatest real characters of the time, including Jimmy Doolittle, Hap Arnold, William Randolph Hearst and Ronald Reagan, whose presence cleverly supports the adventures of the main characters, WWII aviation is the essence and there is more than enough flying for most air buffs, The author's research is impressive and the 500.page journey is one of high energy from start to finish, Grab a glass of wine, settle in with this one after dinner and as Bette Davis said, 'Fasten your seat belt, it's gonna be a bumpy night.'" "What Tom Clancy did for submarines, Frank Johnson has done for the P-51 Mustang. His storytelling takes you as close to aerial combat as you should ever hope to get. 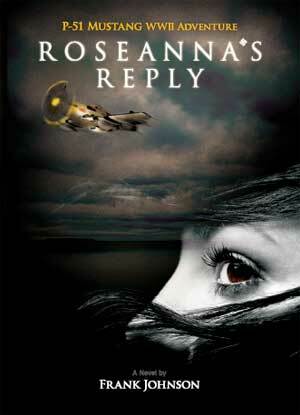 Roseanna's Reply is a love-and-war epic that celebrates the grand virtues of a bygone era. It's a big story, powerfully told, of a troubled young woman who has the guts to embrace the warrior within. But it is also a tale of WWII intrigue that takes the reader from the blacked-out streets of L.A. to savage combat in the skies above Europe, with many vivid stops in between. It's inspiration is in the fascinating and fractious history of the P-51 Mustang itself, which emerged from obscurity to become the most famous and important fighter of WWII. So climb into the cockpit and get ready for the ride of your life"
What most impressed me about this book was the dialogue. Realistic interaction between characters is not an easy chore, and I find that first-time novelists usually don't do well with it.. Roseanna's Reply is a major exception to the rule. The character development is solid and all the characters carry their weight and contribute to the story.. The plot and action flowed ,..and I looked forward each night to picking it back up to see where things would go."